Welcome guest! You are not currently logged in. There is a new product called the Sinden Lightgun. It allows line of sight aiming on LCD tv's and monitors without an IR sensor bar needed. The developer of the product is amazing! He is very responsive and always looking for feedback from the community about what's important to potential users. Go check out the kickstarter, and if possible, pledge, or get in early on this amazing tech. 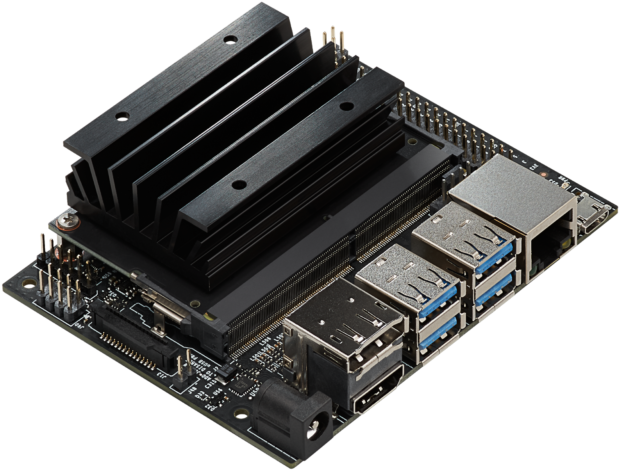 Those who couldn't even look at the Raspberry Pi due to its lack of horsepower may be interested in the new Jetson Nano from Nvidia. It's marketed as a cheap AI platform for homebrew/classroom development and even mass production, but it packs a huge punch in terms of CPU/GPU, with half of a Nintendo Switch's worth of graphic cores and 4 GB of RAM powered from 5V. There's also plenty of ports for expansion, a full SDK and proper documentation, being a CUDA product from Nvidia and all that. It runs Linux for Tegra out of the box, so it's basically emulation ready. Exciting stuff. I'm going to try to move the forum over to the new server today, Saturday March 9th. At some point today I'm going to put this forum into maintenance mode, pull a final backup, and import into the new server. Then I will update DNS to point forum.arcadecontrols.com over to the new server. And for a lot of folks, that won't work for a while So if you keep coming to the old server (it will say old server and be in maintenance mode), use http://newforum.arcadecontrols.com/ as your link temporarily, which should be working as of now (but isn't ready for company yet). 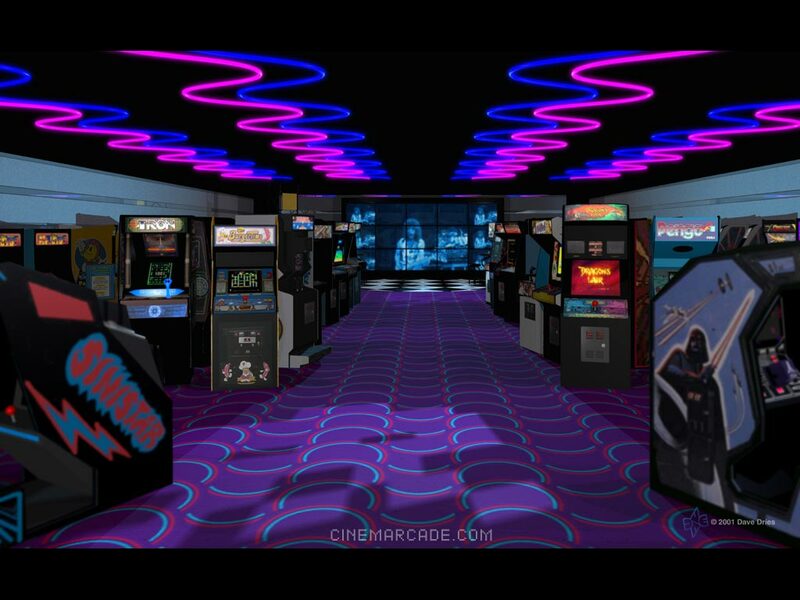 David Dries has graciously given me permission to host a permanent archived mirror of Cinemarcade, home of the Arcade84 video and other arcade nostalgia goodness. If you are *not* familiar with Arcade84 then seriously you're missing out. Take a look. If you are, then you know how sad it would be to see Cinemarcade disappear from the net. Thanks for the hard work and for letting us keep it alive here Dave! Mamesaver can be downloaded here, or you can build it yourself. Mamesaver is open source and released under the MIT Licence. Feature requests, pull requests and bug reports are always welcome! Win an X-Arcade arcade machine in October! X-Arcade is giving away one of their arcade machines in October to people who sign up for their mailing list! (I'm on the list, it's pretty low-volume). New “Fruit Machine” theme added to meet the need of a growing number of users for a slot machine theme. 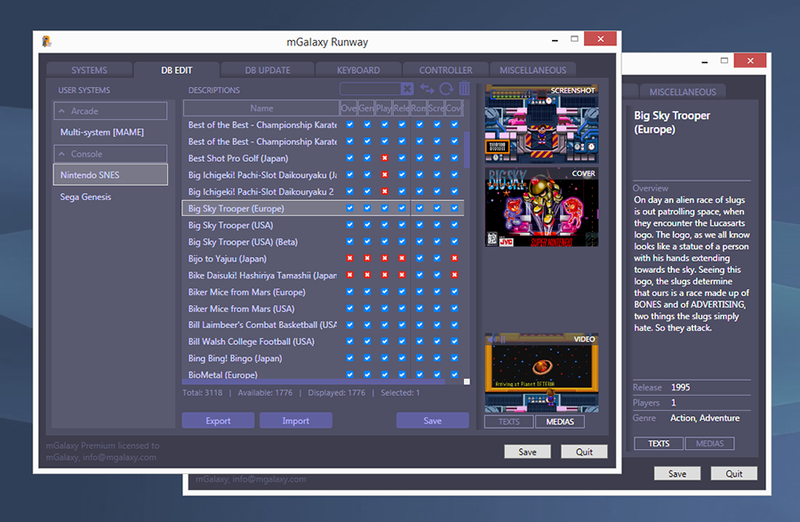 mGalaxy_Runway: Database > Mame database creation further simplified. mGalaxy_Runway: Database > ‘history.dat’ support added to Mame DB. mGalaxy_Runway: Database > Image preview while scraping from databases. mGalaxy_Runway: When duplicating a system, you now get the option to copy user files (database, favorites, top10,…) from the ‘original’ system to the ‘duplicated’ system. Received an email from X-Arcade today that they expect to sell out of their remaining stock of CRT monitors shortly. The CRT featured in our arcade machine is no longer in production and we are down to the last remaining inventory. We should be running out by end of this month, so if you wish to own an authentic CRT monitor, please order immediately! We will shift to an LCD once our remaining stock is depleted. No companies are willing to produce any more CRT arcade monitors. First come, first serve." I've put up a small tool that might aid LCD users to prevent tearing when gaming. We all know CRU can update your EDID settings, but that does not have command-line support. That makes it quite inconvenient to change your refresh rates for every single game you play (especially on MAME). I have created RatRefresh to help with that. It's a simple tool that allows you to update EDID settings from commandline. What can it do? So this might be ideal for your LCD-powered MAME-cab! Check it out here. mGalaxy_Runway : Database > Hidden items can be restored to ‘Visible’. mGalaxy_Runway: Database > New database server added. mGalaxy_Runway: Database > Media download extended to movies, clear logos, fan arts. 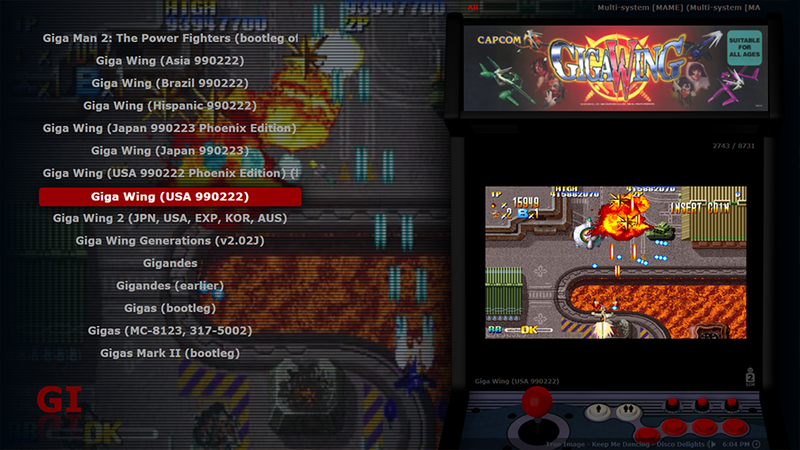 mGalaxy_Runway: Mame database creation further simplified: “Catver.ini” & “nplayers.ini” automatically downloaded when missing. More details, PDFs, step by step guides, and and video at the link. Holy cow! Are we up? We look up! Are we really up? I *think* we're up! I'm going to leave the server in maintenance mode for a while, possibly all day, while I make sure we're reliably up and stable and that everything's working. I'm positive there are things that aren't working yet, for instance the wiki. However, the main site and forum appear to be online. Thanks for bearing with me folks while we worked through our outage. The hard drives in the RAID configuration on the old server died, one at a time. We replaced them, but somewhere in the replacing we lost the boot partition, and despite the fact that it should be relatively easy to restore, we could-not-get-it-to-boot again. Since the server was 4 years old at least, we had already been contemplating upgrading to a new box, so took the time to do so. We still had access to the old server's drives via a rescue boot environment, so migrating was doable. It took a bit to get the new server online and configured, primarily because I used the transition as an exercise to improve my server administration skills with Linux. The final snag was the version of the Ubuntu we're running on the new box doesn't support the version of php SMF requires, and SMF isn't upgraded for the new version of PHP yet. Got that resolved this morning, and now it's hopefully just a matter of troubleshooting various quirks and settings until we get everything resolved. BIG THANKS to sirwoogie for holding my hand through this process and helping teach me to fish! Several of you have offered your time or financial donations to help. Thank you, thank you, I very much appreciate it. In the future I won't be shy about accepting offers of expertise. As for financial donations, thank you for the offers, but please consider donating to charitable organizations or those in need such as relief for the Louisiana flooding victims. BYOAC/arcadecontrols.com is my way of giving something back to the community. There's such a wealth of knowledge and resources out on the Internet, and BYOAC is my way of being a small part of that. Maintaining the server is within my means, and as long as there's any interest in what BYOAC hosts, I'll continue to keep the server online. 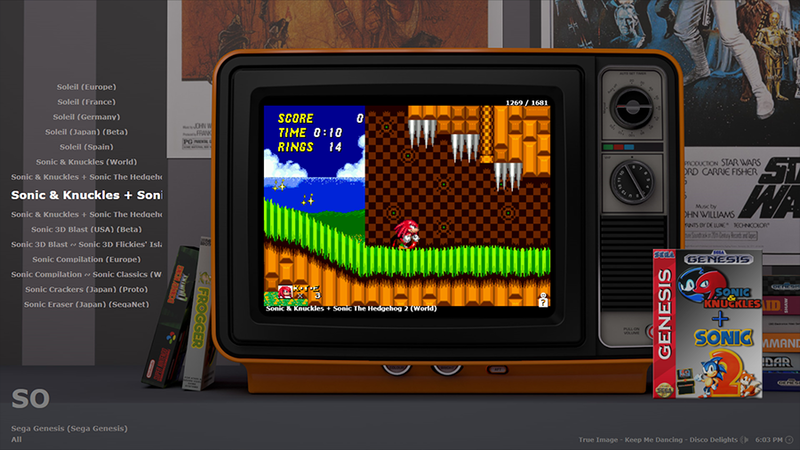 • RetroArch added to available systems. • Uppercase and lower case rom file extensions are now allowed. • Localization (French, German, Portuguese for now!). • mGalaxy_Runway system creation setup revised. • Systems window: filtering on arcade/computer/console. • mGalaxy_Runway: box/marquee images support (for themes allowing this functionality). • Child lock (per key/button). • Compatible with every screen resolution (e.g. 640x480px). • mGalaxy_Runway: database creator (with resume functionality). • mGalaxy_Runway: database editor (Premium). • mGalaxy_Runway: data/media export (database, favorites, roms, snaps, boxes, videos). I have put many many (did I mention many) hours in to this project... as well as more than a couple hundred bucks... and it was looking like it would never see the light of day. Basically ... I burned out. For the last year it sat. This year, when the domain name came up for renewal... I decided I was going to put the damn thing online and see where it goes. If it sees moderate success, I will buckle down and complete it. Essentially all letters have been populated minus the letters S and T. Unfortunately... there are "A LOT" of S and T games. That said, the names are there, just the data within each record hasn't been added. It's a long tedious job... but one I am willing to do if the site is used. I really think that it could become a useful tool for collectors if we get enough participation from the community. Basically, it will become what the community makes of it. I am still working on a bug or two that cropped up when multiple people started reviewing, but they'll get handled. I am also open to suggestions, etc. Feel free to take a look and if you'd like to help the site reach it's potential, sign up and review a few games! The long-awaited (? ) video game documentary Man VS. Snake: The Long and Twisted Tale of Nibbler is now in wide release. Kickstarter backers of the film were able to obtain a digital copy on Thurs., June 23 with the general public's wide release on Fri., June 24. The movie has previously only seen limited screenings at film festivals since September 2015, winning numerous awards along the way. The latest film to take place in the world of high score champions on vintage arcade game, Man VS Snake focuses on the story of Iowa's Tim McVey. In 1984, McVey became the first video game player in history to score over 1 billion points of a video game as he toppled Rock Ola's Nibbler in an Ottumwa, Iowa video arcade. For his accomplishment, he was awarded with an arcade game, the key to the city and the first and still-only civic day named in honor of a video gamer. Posted this over on KLOV but realized I was an oaf and it had not been posted here (POSTED THIS UNDER GENERAL AS WELL). Just thought I would plug this. We'll be there this year again with the arcade. Hope to have a 100+ working games this year. SINCE last year, added Astron Belt, Galaxy Ranger, Tailgunner, dedicated Wild Gunman, Sea Raider, Stunt Pilot, Tapper, Ninja Warriors, Dig Dug, TRON, Frogger, Vanguard, Liberator, Starship 1, Star Trek TOS upright, Guwange, Death Race, In the Hunt, , Turkey Shoot, and a bunch more I'm forgetting. Our total should rise from 78 last year to over 100 this year (including 8 pins I believe). Most of the Rogue Synapse homebrews will be there including STARFIGHTER (the TOS sim will not be there this year as it's being built into it's final enormous cabinet). 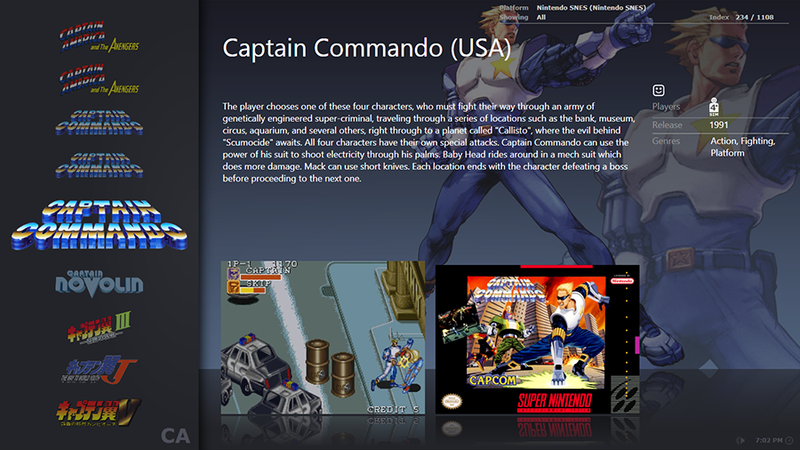 There are customs/skins as well including Splatterhouse, Evil Dead pin, Guwange, Wild Gunman, and Ultraman. The contests this year include Galaga. The high score for the weekend WALKS AWAY with a cabaret GALAGA (60-in-1). Awesome little machine recently shopped out. THAT'S RIGHT, THE HIGH SCORE WILL WIN A 60-IN-ONE CABARET SKINNED AS GALAGA. Was tempted to add the little guy to my collection when completed . . .
JOHN NEWCOMER will be there speaking and will oversee a head-to-head Joust competition, perhaps challenging the victor to a game. Pretty damn cool! We will have (hopefully) 2 tournament upright Jousts, Joust cocktail, Joust 2 and Joust pinball. That makes 5 titles of his there (Joust, Joust 2, Sinistar, Turkey Shoot, and Narc). THAT'S RIGHT, YOU MAY GET A CHANCE TO PLAY JOHN NEWCOMER AT JOUST OR WIN A SIGNED JOUST ARCADE POSTER. Tons of console stuff, board games, vendors, and cosplay as well. Here is a link to a walkthru from last year. Most all the games shown will be there (a few have gone down this week and are problematic, Black Tiger will not be back as this was last years prize). Come find us in the arcade if you get a chance to drop by the expo. Many of the attendees are console crowd so we'd love to add more arcaders to the mix. There are two upcoming gaming conventions you may want to go check out. In Georgia, the Southern Friend Gaming Expo is this weekend, June 10th - June 12th. "The Southern-Fried Gameroom Expo features more than 250 arcade, pinball and console machines, the third annual Southern-Fried Pinball Tournament, tabletop gaming, a vendor expo, exciting programs and guest speakers, movie screenings, and other special events." Then the following weekend, the Let's Play Gaming Expo takes place in Plano, TX on June 18th and June 19th with a special guest! "An Interactive Video Game Convention with Vendors, Arcades, Tournaments and much more! LPGE is packed with tournaments this year, including an epic survival tournament on the classic arcade game Joust. Competitors will face off against each other on the hardest setting and with no extra lives. The eventual winner will then compete against John Newcomer – the creator of the game – head-to-head! Do you have what it takes?" Server status - what's been happening, what's happening next? The short version: We had a drive failure causing massive CPU utilization, bogging the system down but appearing at first glance to be possibly a SQL problem. The bad drive has been replaced and we are, for now, back in business. We still need to do some miscellaneous cleanup/updates, and the *other* drive is showing signs of failure so we are going to have to replace it as well in the near future, but down time should be controlled and minimal. 2016 is in full swing and that means it is time for another annual Arcade/Pinball prize raffle!!! I am a volunteer and supporter of the March of Dimes mission to eliminate pre-term birth and the health complications associated with it. 3 of my Nieces were preemies and spend time in the NICU, so I know first hand how valuable the March of Dimes is. 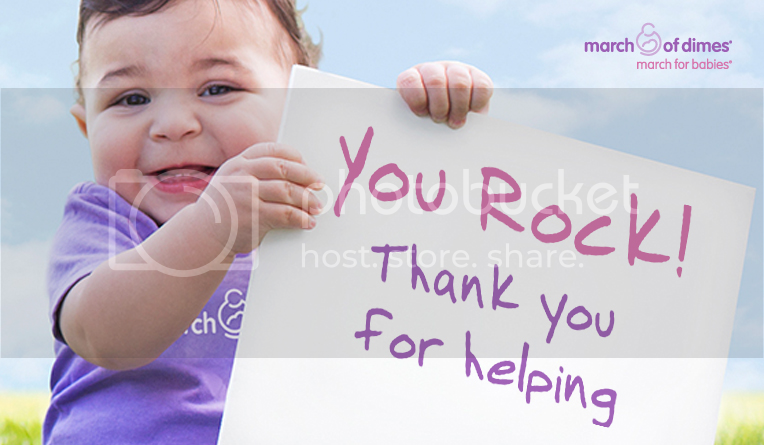 Please join with me to donate to the cause and support "a fighting chance for all babies"! Every donation get automatically entered into the annual Arcade/Pinball prize raffle! Vendors have showed their support of the March of Dimes by contributing some great items to the prize pool, everything from apparel, tools, parts, artwork, gift certificates, and more will be available. The prize raffle goes life at the end of my fundraising campaign on May 6th, 2016. The person who makes the largest donation get 1st choice of the available prizes in the raffle. Then progressing down the list of participants until everyone receives a prize or until all prizes are awarded (for the last several years I've had enough prizes to go around, but no guarantees). Step 2 * Please use an email address you actually check when making you donation (this is how I contact you when it is your turn to select a prize in the raffle). Step 3 * Contact me via PM, email, or leave a comment on my March of Dimes page with your shipping address and t-shirt size. That's it, then just wait to be contacted when it is your turn to select a prize from the raffle. Thanks in advance to all the prize sponsors this year and to everyone who participates. This event gets bigger every year (which is more work for me) but all of the support for the March of Dimes is worth it! You can read more about it, including the large list of prizes, on the official message thread! 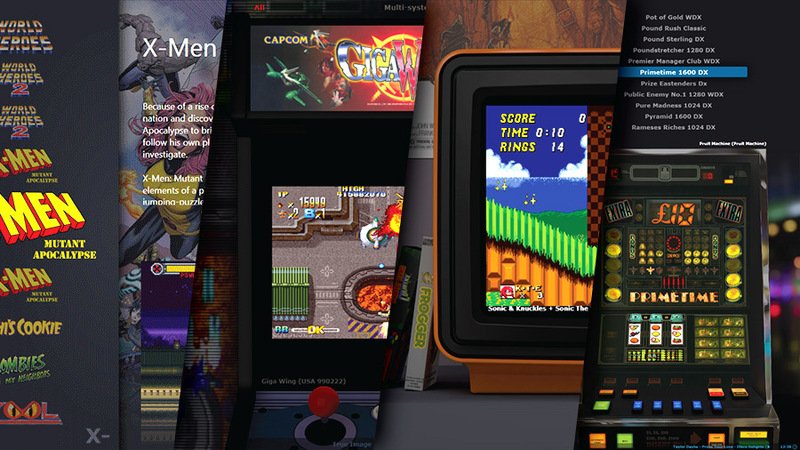 "Classic bluetooth controller for Android, iOS (ICADE mode only), Mac OS, Windows and RetroN 5. Enjoy wireless control of games on your computer, tablet or smartphone with the iconic design of Nintendo's first game consoles. 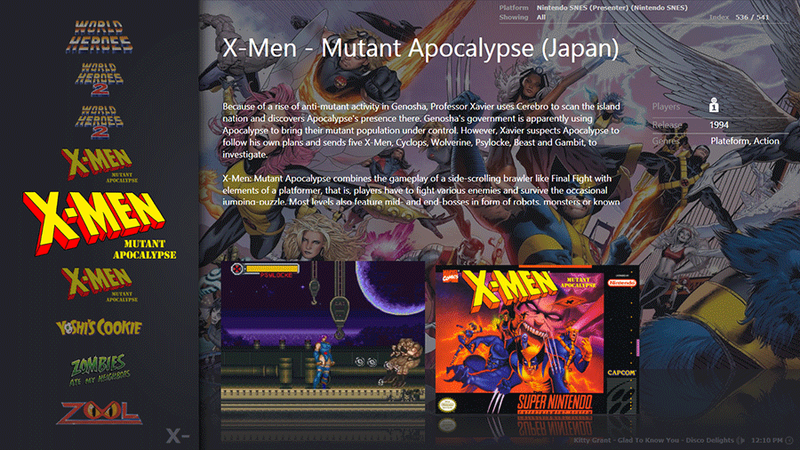 Ideal for emulation of NES/SNES titles on your favorite device. Use wirelessly or connect via included USB cable. Includes license for Maximus Arcade for PC ($25 Value)"
If you have contributed to the MAME source code and believe we have not contacted you, please reach out to us at our contact page. Please note that MAME is a registered trademark of Nicola Salmoria, and permission is required to use the "MAME" name, logo or wordmark. Owned, maintained, and copyrighted by John St.Clair (saint), with help from server and forum guru sirwoogie.